(Money Magazine) -- On those Mondays when he returned from a week of hiking, Steve Silberberg felt renewed. "My clothes fit better and my disposition was improved," he says. Wanting to have that feeling more often -- and to help others achieve it -- the computer programmer began saving to start a backpacking tour company. 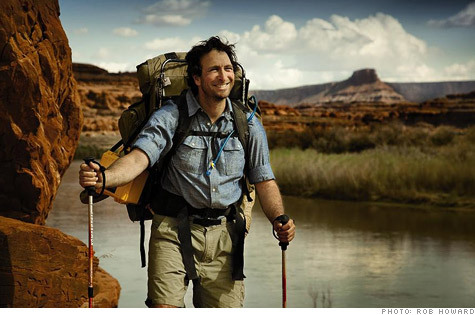 In 2005 he founded Fitpacking, which offers one- to two-week hikes for $975 to $1,700 a head. Rather than target hard-core adventurers, he markets to those wanting to lose weight. This year Silberberg has 15 trips planned, to parks like Yosemite and Mount Rainier, and is on track to earn $30,000. While he expects to double his take in 2011, he's still way off his previous income ($125,000). But, he says, "I really like the trail I'm on." 1. By sticking to a budget. Silberberg, who is single, saved $50,000 to start the biz. He caps annual spending at $10,000, using that for equipment, online keyword advertising, and liability insurance. 2. By responding to the economy. He cut the number of hikes in '09 and took on programming gigs to boost his slim $15,000 profit. But with the economy thawing, demand for hikes has doubled this year, he says. 3. By bringing on help. This year Silberberg, who runs the company out of his Hull, Mass., home, began contracting with guides so that he can offer a greater variety of trips and focus more on sales.